The Futuro Cube, also known as Rubik's Futuro Cube, is an electronic cube-shaped device with a 3×3 array of lights on each side. As well as the lights which can display 6 colours, it plays sound and speech, and can vibrate. It has sensors in it that can tell it which side is up, and can sense when you tap any of the six sides. It allows you to play many games and puzzles on it. It has an USB connection so that you can charge the battery and even even reprogram it if you wish using the development kit that is freely available from the puzzle's website. Here is a quick reference guide and list of menu options. Connect the cube to computer or charger. Shake the cube in a circular motion, for about three circles. While in menu mode, tap a bottom of the cube twice. Also occurs if left unmoved for 10 minutes. While in menu mode, tap a side of the cube. While in menu mode, turn the cube so that the option you want is at the top. While in menu mode, turn the cube so that the option you want is at the top, then tap a top of the cube once. While in menu mode, turn the cube so that the option you want is at the top, then tap a top of the cube twice. While in menu mode, turn the cube so that the option you want is at the top, then tap a top of the cube three times. Choose the transport mode in the menus. Also occurs if left unmoved for 24 hours. Two-player game. Players alternate placing stone of their colour. The first to get 5 of their pieces in a straight line wins. The cube plays as the second player. One-player game. Move the snake around without it running into itself, while growing as long as possible by eating apples. The snake always moves up, so you can tilt the cube to make the snake turn. Green apples make the snake go straight ahead for a while without turning. Two-player game. Players alternate placing stone of their colour. The first to make a path that connects two squares that are on directly opposite sides of the centre of the cube wins. The cube plays as the second player. One-player game. Tetris pieces appear on one side. Place the pieces on the other five faces of cube. Each filled face or filled ring will disappear and score points. One-player game. Try to keep up with the moving spot by keeping it on top of the cube. Two-player game. Players alternate placing stone of their colour. The first to make a path that connects two squares that are on directly opposite sides of the centre of the cube wins. Played against another person with a second cube. Two-player game. Players alternate placing stone of their colour. The first to get 5 of their pieces in a straight line wins. Played against another person with a second cube. Two-player game. Tetris pieces appear on one side. Place the pieces on the other five faces of cube. Each filled face or filled ring will disappear and score points. Played against another person with a second cube. Play music by tilting the cube and tapping any of the faces. There are 36 notes available, 6 for each orientation of the cube. One-player puzzle game. The board gets half-filled with lights of 3 colours. When you tap, the light on the top face fall down one step. Get each colour into a single connected region, but such that those regions are not connected. One-player puzzle game. You control the blue spot by tapping a side to move towards. Push the red bricks around onto the green dots. Purple dots are walls that block movement. Press side opposite the blue dot to undo a move. Has 6 levels. One-player puzzle game. Move through a random hidden maze. Try to find the sound spots, and visit them in low to high order to solve the maze. Choose 1 for no sound, no vibration; 2 for vibration, no sound; 3 to 6 for various sound levels. Recommended amximum is 5. Tap 3 times to go into transportation mode. There are two permutation puzzles amongst these, namely Gravity Puzzle and Ring Dream, which are discussed in more detail on the rest of this page below. There are 9 pieces of each colour, mixed over the 54 squares. The aim is to make each side of the cube a single colour. Tapping the top face turns that face clockwise a q uarter turn. Tapping a side shifts the piece of the top face one step towards that side, the pieces on that side downwards to the bottom, and so on - all 36 pieces on the top face, the tapped face, and their opposite faces move like a band around the cube. 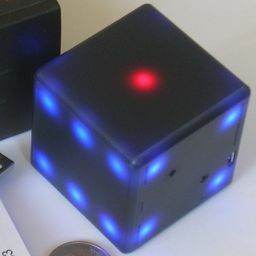 When you tilt the cube, a ring of pieces lights up. If a face is upwards, the ring consists of the 8 outer lights of that face. If an edge is upwards, the ring consists of the 8 lights around that edge. Tapping any side shifts that ring one step clockwise. Futuro Cube. On the Futuro Cube website you can buy them, and download the development kit. For both Gravity Puzzle and Ring Dream, there are 6 colours with 9 pieces each. This gives a maximum of 54! / 9!6 = 1.01·1038 positions. On the Gravity Puzzle these are all solvable. On the Ring Dream puzzle, the centres of the faces cannot move. Therefore there are really only 48 pieces, 8 of each colour. This gives a total of 48! / 8!6 = 2.89·1033 positions, all of which are possible. Look at the centre light of the front face. This is the colour the face will become. Find a light of the front colour but which does not lie in the front face. If that light lies in the back face, then use any moves that do not disturb any previously solved lights to bring the light to another face. Hold the puzzle so that the light lies in the top face (and still belongs in the front face). Rotate the top face loop so that the light is at the right middle of the top face. Rotate the front face (temporarily tilting the cube up to allow that move) until the top-right corner of the face is a light of the wrong colour. Rotate the ring around the front-top edge four times. Rotate the top face once, making three-in a row along the front edge. Rotate the ring around the front-top edge four times, to insert the three lights back into the front face. Repeat steps b-i until the front face is solved. Repeat steps b-j for each unsolved face, until the whole cube is solved. A clockwise twist of the Front, Right or Up face will be denoted by F, R, and U. Of course you will have to temporarily tilt the cube to turn the F or R face. A shift of the top face lights towards the right, left, back, or front (by a tap on a side face) will be denoted by the lower case letters r, l, b, and f. You can move the front lights left or right by temporarily tilting the front face up and tapping the left or right sides. These two moves will be denoted by w and e, for west and east. The location of any particular light can also be denoted using two or three of these letters together. The first letter denotes the face, the next one or two letters determine which of the 9 light locations in that face is meant. For example, Ufl means the light in the top face at the front-left corner, and Fu means the light in the front face at the top edge. The centre light will be denoted with the letter c, so Uc is the centre of the top face. I solve this puzzle one colour at a time, building each face up by making a row of three lights and adding it to the face. You can often improvise and take adavantage of lights that happen to be already adjacent. It is too difficult however to describe such improvisation in such detail. The final two faces then need a few other move sequences to swap the last few pieces. Before describing the solution, it is necessary to know how to move a light from one face of the cube to another without disturbing any previously solved faces. For example, to move a light from the R face to the U face, you can use the following steps. If the light you want to move is at Rc, the centre of the R face, then do r RR l.
Otherwise, turn the R face until the light is at the Ruf corner or Rf edge. These moves move the light from the R face to the U face without disturbing any other face, and also without disturbing the left two columns of the U face (only Ur, Ubr, Ufr are affected). Phase 1: Solve a face. Hold the puzzle so that the U and R faces are unsolved, and the F face is the face that you want to solve. Choose the colour that you want the front face to be. Find a light of the colour that you want to use. Move the light into the U face if it is not there already, but without permanently disturbing previously solved faces. See above for an explanation. Find a second light of the chosen colour. Bring it to the U face, without dislodging the previous light. If you can arrange for the two lights to become adjacent, then do so. If the two lights are not adjacent, then there are several cases. If both lights are edge lights (i.e. at the Uf, Ub, Ul, Ur locations), or if neither are edge lights, then you need to fix this by moving one of the lights to the R face, then to the F face, and then back to the U face. The moved light will now change its type, changing from corner to edge or vice versa. If one light is at an edge, the other at a corner, and they are not adjacent, then bring them together by turning U until one light is at Ur, do r, turn U until the lights are adjacent, and do l.
Move the pair of adjacent lights so that one is in the centre of the U face. This is done by turning U until one of the lights is at Ul, then do r, then turn U until the other light is at Ur, and finally do l.
Find a third light of the chosen colour. Bring it to the U face, without dislodging the previous pair of lights. If you can arrange for the three lights to be in a row, then do so. If the three lights are not in a row, then there are several cases. One is in the centre, the other two are at the edges. Rotate U until they are at Uf and Ur, and do the moves r R R l U r R R l.
Just to reiterate, hold the puzzle so that the U is the face with the triplet, R is an unsolved face, and the F face is the face that you want to solve and where the triplet belongs. Bring the triplet to the front face, adjacent to any previous triplets you may have solved already. You can do this using the following steps. Rotate U to bring make the triplet to the front or middle row of the face (i.e. at Ufl, Uf, Ufr, or at Ul, Uc, Ur). Repeat all the above from step c two more times. This way you have placed three triplets in the front face, solving it. Phase 2: Solve three more faces. Simply repeat phase 1 three more times. Make sure that the third face you solve is adjacent to the first two, so that when you solve the fourth face the two still unsolved faces are adjacent to it. Phase 3: Solve the last two faces. Hold the puzzle so that the two remaining faces are the F and R faces. Ensure that the centre of the F and R faces have different colours. This is easy to arrange by doing w F e, or w w F e e a few times. If you can partially solve the two faces using such moves (in combination with F and R moves) then so much the better, as long as the centres end up having different colours. Repeat step c until all the incorrect lights have been swapped, solving the final two faces.